Ideal for boutiques, trade shows, formal dinners and conferences Specially designed to be noticeable when denoting names, buffet-table items or product descriptions. 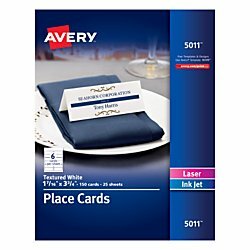 Use as place cards, buffet cards, menu cards or even product description cards at special events. The textured premium card stock stands up to frequent handling. Perforated and prescored for easy separating and folding after printing. Printable with your laser or inkjet printer.